Just before Christmas I asked Dave to make one of my favourite dishes: (Veggie) Bacon, Cabbage and Cannellini Bean Soup. I also asked him to share his recipe with me so I can make it too (I’ve made it in the past but it just didn’t taste as good as his version) so I needed to learn his secret! This January, after the excesses of Christmas I’m attempting to eat a more vegan (as opposed to my usual vegetarian) diet and also give up alcohol for the rest of the month. Thankfully, the vegetarian bacon can be substituted with vegan bacon (and of course also real bacon as Dave uses in his own dish). I find that every year, more and more vegan products are available which help make Veganuary a lot easier. If you are also taking part in Dry January, then you can leave out the white wine or substitute it for white wine vinegar. It is such a rich, treat dish with the wine though. Rinse and drain the tin of cannelinni beans. Heat oil and fry the vegan bacon for 5 minutes. Add onion and fry until softened. Add carrots, potato and herbs and fry together for a few minutes. Add the drained cannellini beans and the stock. Season with pepper and soy sauce. Cook on low heat for 20 minutes. Add cabbage, cover and cook for approximately 10 minutes (until cabbage is tender). Blend one third of the soup, then re-add this creamed soup to the pot. 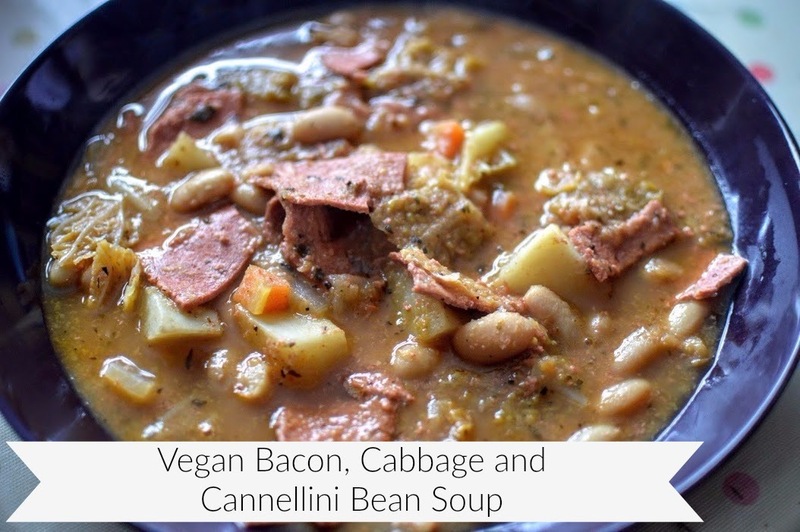 Stir well and this delicious Vegan Bacon, Cabbage and Cannelinni Bean Soup is ready. This recipe serves four and tastes even better the following day. Cannellini beans are a good source of protein for vegans and vegetarians. They are full of nutrients, can reduce cholesterol and provide steady energy throughout the day. Savoy cabbage is also rich in nutrients and a good source of dietary fibre and protein. Will you be making the vegan/veggie or meat version? With wine or without? Either way, enjoy!